With the new 9.7-inch iPad, the Apple Pencil at last comes to the masses. Apple’s recent push to get its scrappy tablet back in schools means you no longer how to shell out mountains of cash if you want to use the iPad like a digital legal pad, and that’s good news for all of us regardless of whether we’re in boardrooms or third-grade history class. Even better for Apple Pencil newcomers, the App Store is already stuffed with note-taking apps that use it to its full potential. Here are our favorites, chosen after years of enthusiastic experimentation. 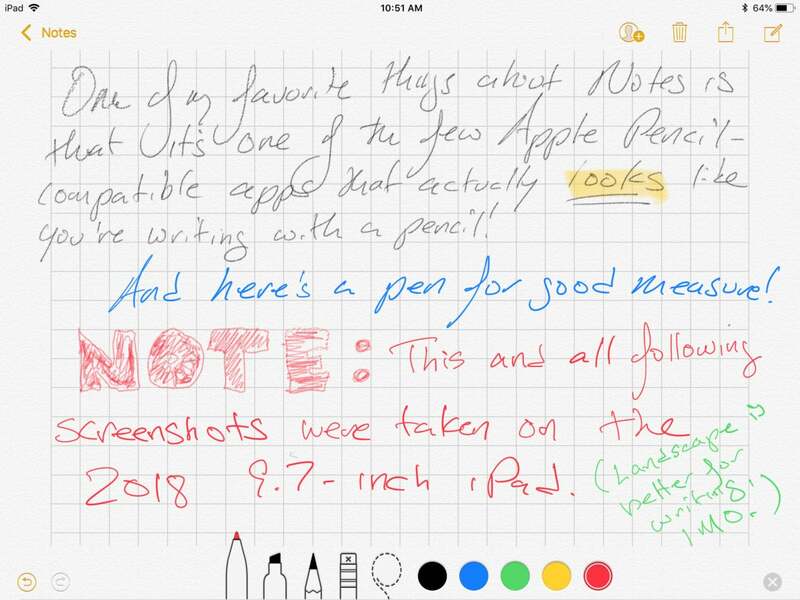 If you want a head start on writing on an iPad with an Apple Pencil, then there’s no better place to start than Apple’s own Notes app. It’s not exactly packed with features: You can’t even adjust the stroke width for the included pen, highlighter, and pencil tools. In fact, true to Apple form, customization feels forbidden. All you can really do is choose between blank, lined, or gridded paper and write in black, blue, green, yellow, or red. Seriously, I’m really impressed with the look of that digital pencil graphite. No other app really comes close. But Notes sometimes makes up for that lack of variety through convenience. 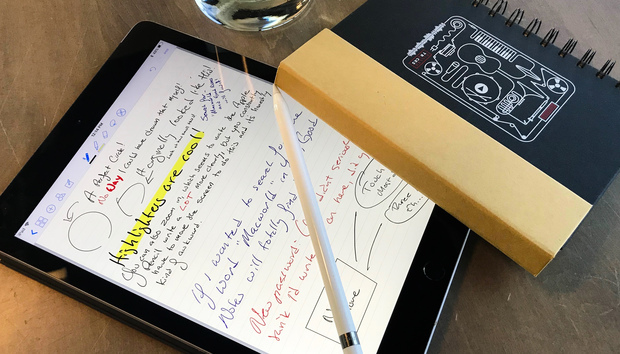 Apple built Notes compatibility into the design of the iPad itself, so you can scribble a new handwritten note at any time by simply tapping the Apple Pencil on your iPad’s locked home screen. The selection tool is also impressive; more so than any other app I’ve used, Notes precisely selects the line of script you want to select, even when it’s piled on top of another jumble of squiggles. It’s kind of magical. The iCloud syncing across all iOS devices is nice, too, but if we’re being blunt, Apple basically did the bare minimum here. To truly see what the Apple Pencil is capable of, you have to look elsewhere (and likely spend a little cash). Notability, fittingly enough, is by far the most notable app that supports the Apple Pencil, and for good reason. 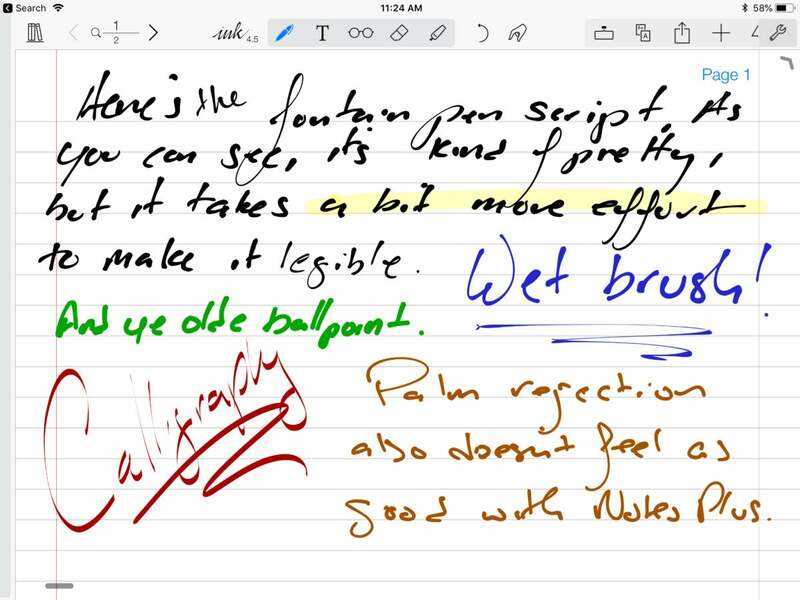 If you’re going to spend money on any handwriting-compatible app, consider spending $10 on this one. 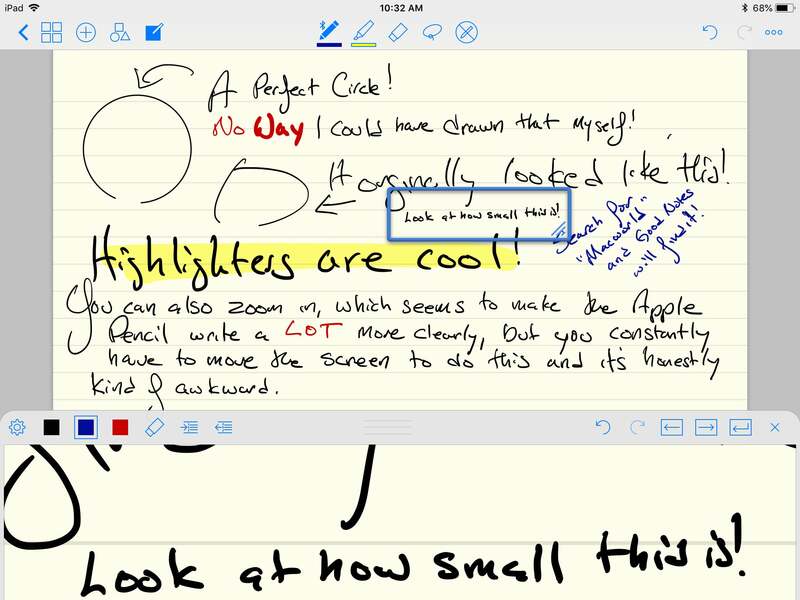 Not only does Notability lets you do everything from annotating PDFs to making shapes, but it also captures the experience of writing with a pen or pencil better than any of its competitors. The strokes are fluid and precise, allowing you to forget about trying to get the stylus to work properly and simply focus on your writing. Notability doesn’t offer many fancy options for writing tools, but the options it does give you work so well that others rarely feel needed. The appeal doesn’t end there, though. Notability also excels by letting you choose between nine styles of lined and unlined paper, and it gives you 15 choices for paper color as well. (Weirdly, none of those choices mimic the sulphuric yellow of a legal pad.) It’s easy to import PDFs and webpages and mark them up as though they were paper. You can record audio while you’re writing by hand, and you can hear exactly what was being said when you wrote a note. Notability’s iCloud support works like a dream, so you can easily write out notes from your iPad and consult them on your (separately sold) Mac app within seconds. You’ll find that feature in traditional note-taking apps like iA Writer, but the ability to call up your handwritten scrawl on your phone at any time counts as a major plus. For one, you can easily create shapes such as triangles, circles, or rectangles. Simply click on the appropriate menu item, doodle the shape on the screen with your Apple Pencil, and GoodNotes automatically converts it into the perfectly formed circle or triangle you had in mind. It doesn’t fully convert your handwritten notes to typewritten text as some apps do, but its handwriting recognition is good enough that you can search all of your notes for specific words. I’m also not a fan of the way the page doesn’t feel the screen when you flip to landscape mode. Need to scribble in a few notes between lines? Just use the magnifying tool, which boxes off a rectangular “window” into a smaller part of the page without the need to pinch in. GoodNotes even does a slightly better job of organizing notes by subject than Notability, as it lets you keep separate notebooks for each class or project, each with their own covers. In some ways, this similarity to print works against it. GoodNotes remains committed to the idea of writing on digital paper as though it were real paper, so it’s not as easy to scroll through multiple sheets of paper, moving the sheet down as you write in one continuous motion. Much as with a regular sheet of paper, you’re stuck with whatever dimensions the page gives you until you flip over on a new one, resulting in the same scrunched-up notes in corners you might recall in school. This design may help with the ton of exports GoodNotes offers for printable paper sizes, but such restrictions feel especially limiting on a 9.7-inch iPad. We’re still a long way from the days when technology can translate your doctor’s scrawl into a crisp line of 12-point Arial, but MyScript Nebo reminds us that we’re getting much closer. 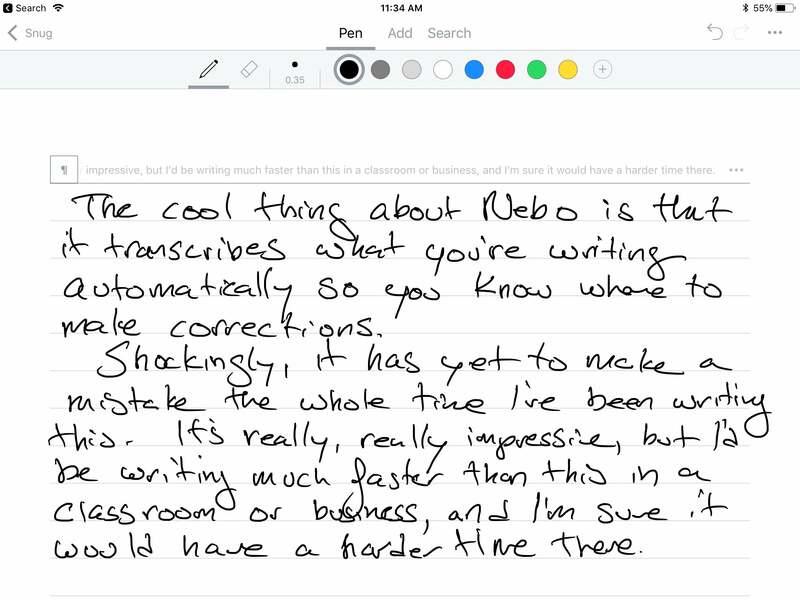 It’s our current favorite pick for handwriting recognition, as it takes carefully written longhand script and —with little more than a tap of the line—transforms it into something you can email. It even gives you a “preview” of how it’s “reading” the line so you know what to correct before a full conversion. Seriously, though: Even though getting it to read like this takes a little longer (with my handwriting), this is seriously impressive. Combine that with a smooth Pencil experience that’s reminiscent of Notability and textual interaction that resembles Notes Plus, and you’ll find it makes a good overall notebook. Just keep in mind that its handwriting recognition isn’t going to magically keep you from doing any transcription. I find that getting the best results out of Nebo requires writing slowly and deliberately, which for me nixes the appeal of writing by hand in the first place. Much of the bad blood that formerly existed between Apple and Microsoft is yesterday’s news, and in fact, Microsoft supports Office on iOS with such devotion that you’d think it was Microsoft’s own operating system. You’ll find that same kind of attention and support in its OneNote app, which offers a wide selection of features as well as support for the Apple Pencil. You’ll need a Microsoft account to use it, but there’s a good chance you’ll have one anyway if your workplace or school is heavily invested in the Microsoft ecosystem. It’s a little like Apple’s own Notes in that it’s mainly there so you can have a place to collect all the little notes you scribble out, but Microsoft goes further than Apple by allowing variations in stroke width and a few extra colors to choose from. Dogs and cats living together—mass insanity! I also admire OneNote for the sheer size of the canvas it offers. 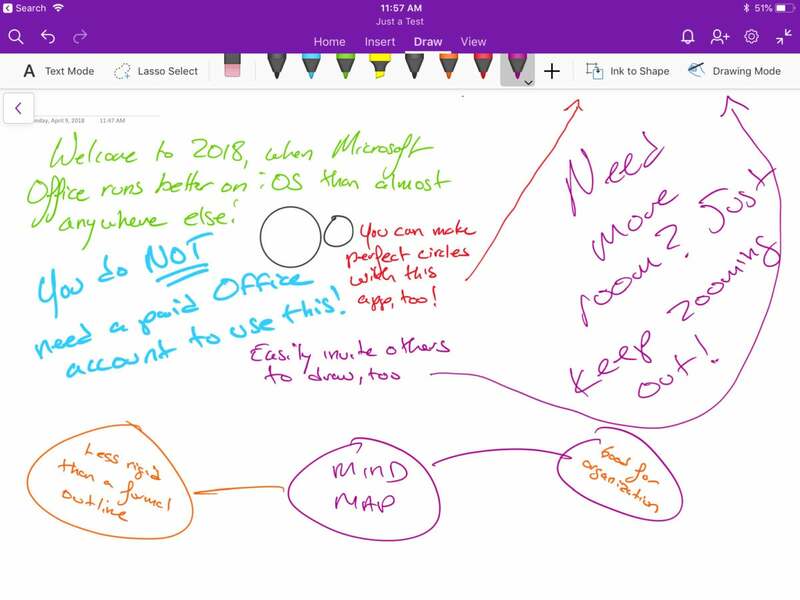 Pinch on the page to zoom out, and you’ll find that you have an absolutely massive amount of room to work with, which makes OneNote ideal for mind maps and similar brainstorming exercises. Unfortunately, that’s probably also why it doesn’t let you export documents to easily sharable files like PDFs like almost every other app listed here. That said, it’s a handy space for note collection, and it offers quite a few more features than Apple it does. As a bonus, OneNote’s Office integration makes it easy to collaborate on projects with friends and colleagues who have Microsoft accounts. Notes Plus offers the least pleasing writing experience out of all the apps listed here, but it makes the cut because no other “understands” writing on an iPad quite so well. GoodNotes 4 may do a lot of features Notes Plus offers better these days, but Notes Plus continues to have a few tricks up its sleeve. 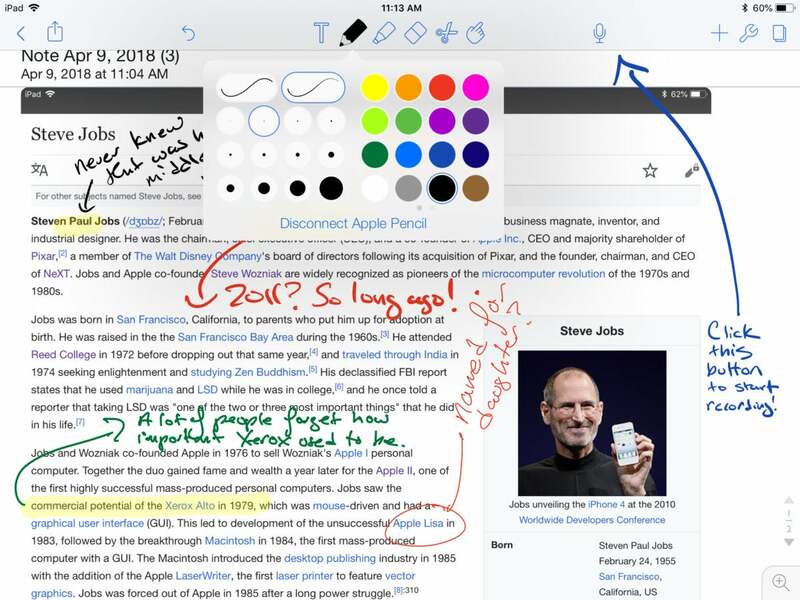 Here (as in Notability), there’s no flipping to a new page to start writing on another sheet; instead, you can just keep scrolling the pages down, comfortably keeping your wrist in one spot. Need to erase something? Don’t bother with an eraser tool—instead, just scratch out the word and it’ll disappear. You don’t even need a selection tool, as Notes Plus automatically selects script when you draw a circle around it. Much like GoodNotes, it lets you make a box for squeezing in a few liner notes. It’s even got an impressive handwriting-to-text tool. It’s not anywhere near as smart as the tool you’ll find in MyScript Nebo, but it usually gets the job done. It’d probably be perfect if it weren’t for the writing performance. The strokes the Pencil lays down feel “sticky,” especially while using the fountain pen and calligraphy tools. Most of the time I found myself sticking with the ballpoint pen and wet brush settings, but even after tinkering with the viscosity and thickness settings, Notes Plus still doesn’t offer as satisfying a writing experience as virtually every other app. Even so, I still find myself returning to it, mainly out of admiration for how well its other pieces fit together.